When entertaining, a cheese plate is often in order. The perfect cheese plate should be easy to assemble, crowd pleasing and make a beautiful presentation. When assembling, it is important to keep the following tips in mind. I like to serve with a grilled baguette, thinly sliced. This is a bit more interesting than a traditional cracker and is always well received. 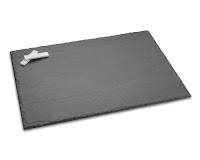 Williams Sonoma Slate Cheese Board $39.95. 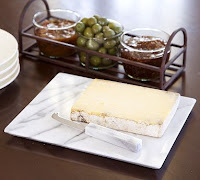 Pottery Barn marble cheese board $29.00. *The first image is Mariposa and it can be found at www.silverimpressions.com. This entry was posted on 7:28 AM and is filed under Cheese tray , entertaining tips . You can follow any responses to this entry through the RSS 2.0 feed. You can leave a response, or trackback from your own site. What beautiful cheese boards. I really like the marble pottery barn board! One of my favorite restaurants in New Orleans is St. James Cheese Shop and they do a wonderful cheese board. Thank you for giving us instructions as to how to make our own! the turtle cheese board is adorable! Love this post! New follower and look forward to reading! Love your blog. Have a fabulous day!! Here in Northern California, home of Cowgirl Creamery etc., we'd say "Don't forget the honey:)." P.S. I'm liking your blog too, just subscribed. Hi LPC! I too love honey with a cheese plate, especially from The Savannah Bee Company! Thanks for your thoughts. Love, love, love cheese plates! And grilled baguette is my absolute favorite!